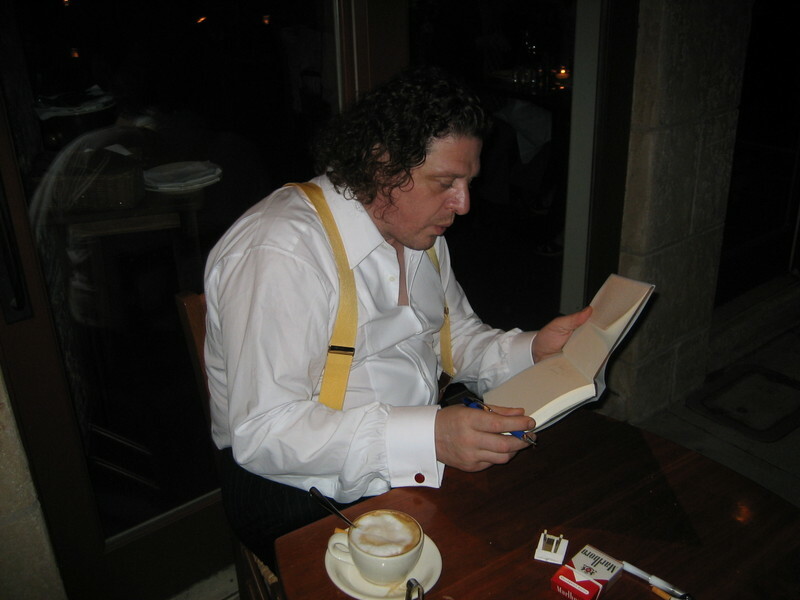 My SFist write up of an Incanto dinner honoring Marco Pierre White is here. Flickr stream here. Menu Pages blurb here. Uber chef Marco Pierre White's book, The Devil in the Kitchen is the food intense story of his life in restaurants. There aren't the usual tales of drugs and booze, but it is fascinating nonetheless. That is one difference from some other modern chef tales & depictions that are popular today. It's clear that White remained devoted to work and practicing his craft above all else: family and relationships were lower priorities. Don't worry, though. He did eventually allow himself to have fun & lovin' with all sorts of ladies. Even better for celebrity chef-philes, there is stellar gossip since he has worked with-and dishes some dirt on-the Roux brothers, Mario Batali, Heston Blumenthal and Gordon Ramsay. There's even a dash of celeb gossip by way of appearances from Madonna, Michael Caine, and Damien Hirst. White's happiness in the kitchen continued to grow after his first experience at getting paid for providing pleasure as a fish seller. Yes, he's happy, but he eventually became a boss who would regularly throw tantrums. With reason. The anger and fits stemmed from a commitment to high quality, which seems to make sense when you consider how much effort White always applied to his food and restaurants. He now has an empire to show for it all. As a boss and business owner, he sought respect and loyalty from those working for and with him. This consistent hard work earned him three Michelin stars, which set a historical precedent because he was the youngest to do so. It shocked some when he gave his stars up when he retired. That's something many chefs wouldn't think to do, because with the stars go notoriety, glory, and ample profits. But it shows White's integrity: why keep stars if he won't be in the kitchen, preparing the food? For chefs like Anthony Bourdain, White was the "original rock star chef" because he was so obsessed and brilliant in his craft. When they see each other, White told me he and Bourdain swap tales over "fags," their beloved cigarettes. White's food lessons are enjoyable and pop up throughout the book. He uses simple and stark language to explain things like the texture and flavor differences in a raw versus grilled tomato. Cooks of all stripes will benefit from his lessons on food, ingredients, cooking and the role of nature. It's not surprising that he has always respected nature, and is a fan of hunting (in person, he calls hunting, "stalking"). His full story is worth checking out. For another review of White's book, read Incanto Chef Chris Cosentino's tribute from this Sunday's San Francisco Chronicle book section. His Editor--okay, it's my husband, Oscar Villalon--told me there was little editing needed. Chef Chris's take on the night can be read here. Wow! Great info. I wish, I could have such a writing skills. Thanks for a kind comment!